Basil, which happens to be a main ingredient in Sensory Revolution‘s Sensational Seasonings green herbal mix, is much more than just a tasty garnish. See below in this excerpt from a great article from Health Food Harvest for the surprising and impressive healing powers of the humble green herb. Basil is an excellent source of a variety of key nutrients, particularly vitamin C, calcium, vitamin A and phosphorus. 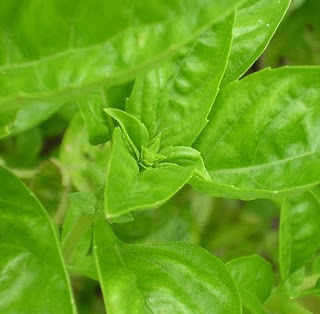 Furthermore, basil is a useful source of magnesium, potassium and iron. Basil has a long history of use in cooking, going back even to the Greek civilization, and probably beyond. This herb is believed to have significant health effects, particularly in improving cardiovascular health. Furthermore, basil is a particularly good source of vitamin A, which is a key nutrient for strong eyesight, plus healthy skin and hair. Basil contains high concentrations of carotenoids such as beta carotene, and these substances are converted to vitamin A in the body. Beta carotene offers even stronger benefits than vitamin A alone, and it is known to be a powerful antioxidant. The importance of antioxidants revolves around their ability to help prevent the cell damage that occurs from free radicals in the body. Free radicals are a natural presence in the body, however, if they get out of control they are thought to cause cell damage that can lead to cancer. Some reseachers now claim that the damage done by these free radicals can be reduced or prevented by eating a diet that is rich in antioxidant vitamins such as beta carotene.